Time once again for another installment of “Movies You Have Not Have Seen….But You Should”. This week we will look at the newest released film that we’ve shared so far in this series. We will look at the 2012 independent film Liberal Arts. The film stars Josh Radnor (who is best known for his role as Ted Mosby on the hit TV sitcom How I Met Your Mother). Radnor also wrote the screenplay to this film along with co-producing it. This dramedy looks at the life of Jesse Fisher (played by Radnor). Fisher is a 35-year-old admissions officer at a college in New York City. His life is in a rut and on top of that he’s recently become single. He loves reading and is enthralled with literature, spending all his free time at the local bookstore and he longs for the days when he was in college back in Ohio. One night he gets a phone call from his old English professor Peter Holberg (played by Richard Jenkins, best known for his roles on the TV show Six Feet Under along with such films as There’s Something About Mary, Snow Falling on Cedars, Dear John, & The Visitor for which he received an Academy Award Nomination). The professor is retiring and the college is hosting a retirement party which Jesse is invited to attend. Jesse accepts and makes the trip back to his alma mater. While there, he meets Zibby, a 19-year-old sophomore drama student and daughter of friends of the professor (played by Elizabeth Olsen, younger sister of Mary-Kate and Ashley Olsen and whose upcoming films include Oldboy and the new Godzilla). The two end up spending some time together talking about life, books and music. Also while he’s on campus, he sees his old romantics professor Judith Fairfield (played by Allison Janney, best known for her work on the TV drama The West Wing, along with such films as American Beauty, Finding Nemo, Juno & The Help) and Dean, a student who Jesse can relate to because of the book that Dean was reading. As time goes on and Jesse goes back to New York, they stay in touch as pen pals and as things go along it precipitates a return trip by Jesse to see Zibby. What happens after that? Well you’ll have to watch the film. Without giving away the ending to Liberal Arts, the film does a great job of looking at how we deal with the past (specifically nostalgia) and in turn the present and future. Radnor does a great job in writing not only for his own character Jesse but also for Zibby and for Professor Holberg. The acting was good from top to bottom with the entire cast, which also included Zac Efron (best known for his role in the High School Musical series along with New Year’s Eve, The Lucky One and The Lorax) who plays Nat in the film and Elisabeth Reaser (best known for her recurring role on the TV show Grey’s Anatomy along with starring in the Twilight films) who plays Ana. The film had a limited theatrical release in September 2012 after debuting at the 2012 Sundance Film Festival back in January. 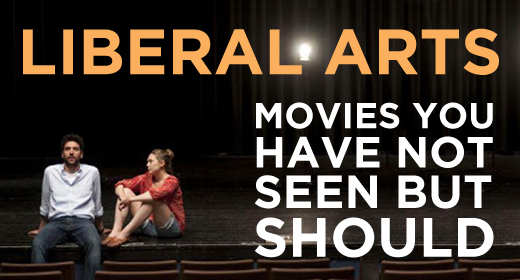 Liberal Arts is available on DVD, Blu-Ray and streaming on Amazon Prime Instant. It is worth checking out if you’re a fan of How I Met Your Mother and like Ted Mosby, if you like a good romantic dramedy or you are supporter of independent films. This is a good definition of a movie you may not have seen, but you should.